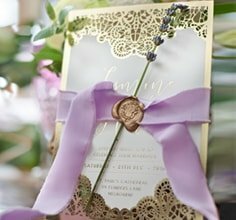 Giant Invitations were lucky enough to personally design Real Housewife of Melbourne – Gamble Breaux’s invitations for her exclusive Byron Bay wedding and they certainly caused quite a stir on the show. After handing out her invitations to fellow housewives, Pettyfleur Berenger rejected Gamble’s invite (or rather olive branch) causing the invitation to go flying from Gamble’s hands and land (not so gracefully) in Gamble’s beautiful Mt Martha garden. This of course caused some serious tension between the ladies! Take a look below to see the drama unfold! Gamble and her wedding planner/gown designer – Alin Le’ Kal worked directly with our team to create an invitation design that was just as glamorous as herself! 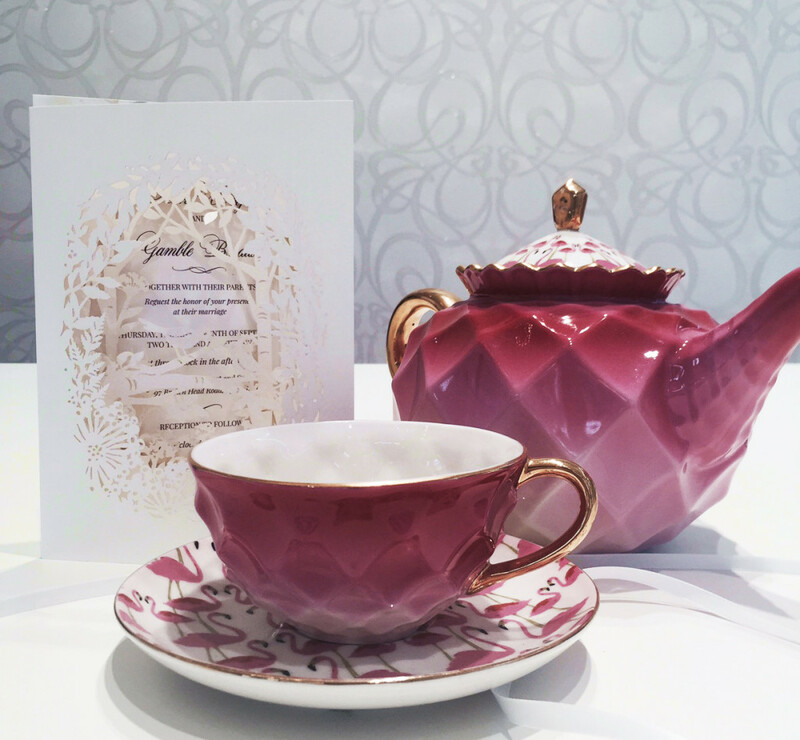 After a visit to our showroom and design studio – we eventually settled on a stunning white on white forest theme. The team first worked intimately with Gamble and Alin to flesh out a theme and once this was settled – drew numerous sketches. All hand drawn with intricate detailing – once there was a cohesive decision on which design to settle on – the invitation went into production! The design included a complex laser cut detail which also acted as a framing and a pop up of delicate birds because her and Rick “are just like two love birds.” The delicate process of laser cutting is truly an art. 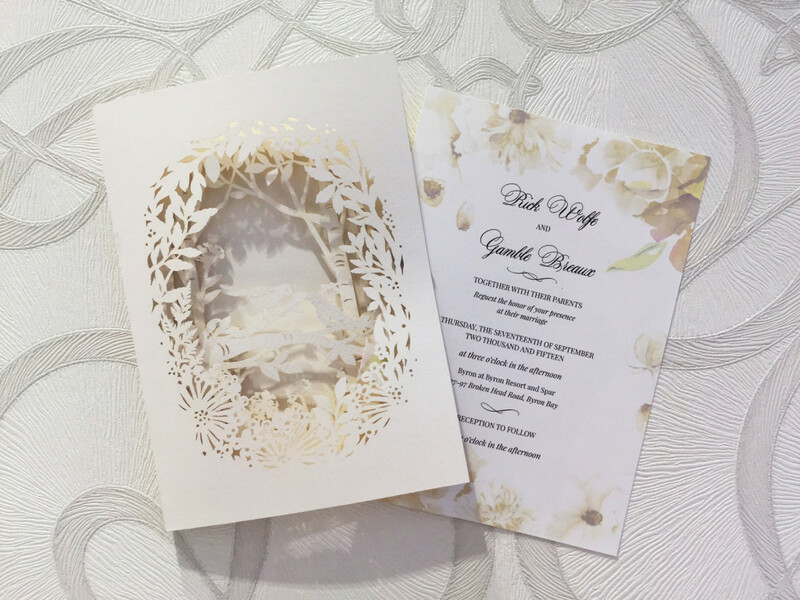 It involves cutting into paper in a non-contact way through the use of a high temperature precision laser creating a pattern that is truly delicate and beautiful. Wanting to keep it as white and bright as possible, colour was kept to a minimum with neutral florals featured on the backing to go along with Gambles earthy and organic wedding theme. The texture that was given from the laser cut pocket acted as a beautiful contrast against the neutral white carding. Although Pettyfleur didn’t seem too impressed with the invitation, Gamble absolutely loved our design! Gamble’s Wedding will air this Sunday on Arena. In the meantime – have a peak at the stunning design that was custom created and grab one for yourself today! We promise they’ll cause a stir for the right reasons.